Plasma is the “fourth” state of matter. All known materials can exist in this state. This is what happens to a gas if you add enough energy to it. 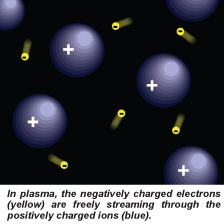 In a plasma, many of the molecules of the material are split up into charged ions, often consisting of individual charged atoms. Plasma is the most common state of visible matter in the universe. The stuff in stars and nebula in outer space is in the state of plasma. The most noticeable properties of a plasma are that it is very sensitive to weak electric and magnetic fields, and that it gives off light. Much of the stuff inside a lit fluorescent bulb or tube is in the state of plasma, as is the flame in a fire. The liquid part of our blood is also referred to as plasma. These two uses of the word are not related. Matter changes its state when energy is supplied to it: solids become liquid, and liquids become gaseous. If even more energy is supplied to a gas, it is ionized and goes into the energy-rich plasma state, the fourth state of matter. In most cases, matter on Earth has electrons that orbit around the atom’s nucleus. The negatively charged electrons are attracted to the positively charged nucleus, so the electrons stay in orbit around the nucleus. When temperatures get REALLY hot, the electrons can escape out of their orbit around the atom’s nucleus. When the electron(s) leave, that leaves behind what scientists call a positively-charged ion. While natural plasmas aren’t found around you that often on Earth, man-made plasmas are everywhere. Think about fluorescent light bulbs. They are not like regular light bulbs. Inside the long tube is a gas. Electricity flows through the tube when the light is turned on. The electricity acts as an energy source and charges up the gas. This charging and exciting of the atoms creates glowing plasma inside the bulb. 1. Blow up a balloon and tie off the end. 3. Rub the balloon vigorously on your hair. 4. Hold the bulb with your other hand and bring the balloon near the bulb and watch what happens. 5. Move the balloon up and down the bulb without touching the bulb. You should see flash of light. It will not be a bright flash, but it should be enough to see. When the static electricity from your hair forces it way through the gas in the tube, the gasis changed into plasma. The plasma is a good conductor of electricity. It also gives off ultraviolet light. It is a color that our eyes cannot see. Luckily, the white powder on the inside of the glass tube glows under ultraviolet light, and we can see the light from that glowing powder.